I have been warned about Kuta. It's a tourist trap gone wild, with big ugly malls and resort hotels, souvenir shops, brand clothes stores, fast food, billboards, and taxi drivers yelling "transport". It's also quite modern and clean. 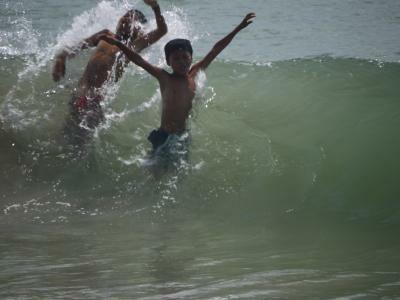 But this is also Bali, and a smile and some friendly words quickly make easy friends. And to escape the hustle of Kuta, I had chosen a guesthouse some distance inland that was very nice, with a shaded pool in a nice garden. 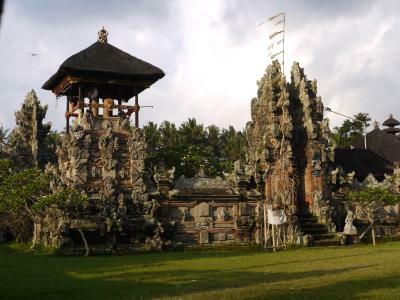 Ubud is a town north of Denpasar, close to the center of the island. It's known as an artist's village. I went there by shuttle, motorcycle, and finally a bemo (a minivan with benches in the back) all to myself. Ubud is a quiet village with none of the hustle of Kuta. It's very green and all the houses are low and unassuming. They are all either souvenir shops selling locally made trinkets, or galleries for paintings or wood sculptures, which amounts to the same thing. A few are tourist restaurants but I found an Indonesian one. They have a market too, which is a labyrinth of souvenir stalls. But the town is so nice and pleasant to walk in that I'll forgive it for the rampant souvenir racket. 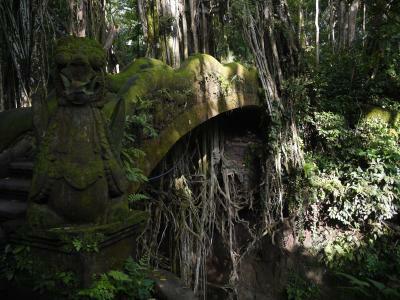 They have a Sacred Monkey Forest Sanctuary at the edge of Ubud. True to its name, lots of monkeys sit on trees and on the paths, and some were enjoying themselves by jumping into a small pool to the delight of the tourists. There is a temple as well, and a number of very scenic paths leading to a river through the jungle. Lots of Banyan trees here; they have big bundles of vine-like roots instead of a trunk. The bridge, stones, and the many statues and sculptures in the park are overgrown with moss. The park feels like a Tomb Raider set. There are trails south of the park that pass through a few villages and rice fields, but the rice fields here look pretty much like the rice fields on Java, so after a couple of hours walking I return to the hotel by motorcycle. The driver doesn't know it and I don't have the address so I navigate him with my GPS receiver. Quiet day. I have spent so much time in buses, hurrying from one place to the next, that I thought a rest day was in order. 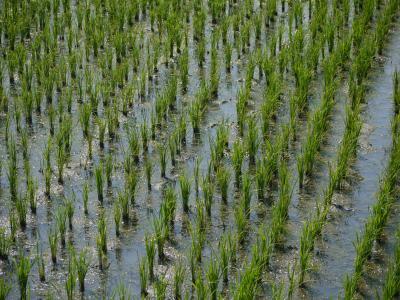 I went to the beach, and walked for several hours through rice fields and little villages. 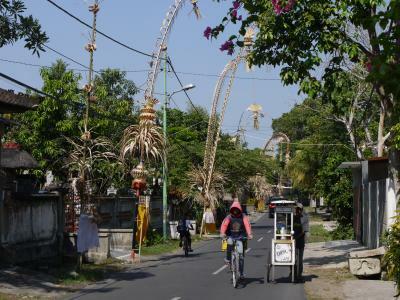 They have lots of roadside shrines, mostly consisting of a little empty throne and some offerings of fruit. 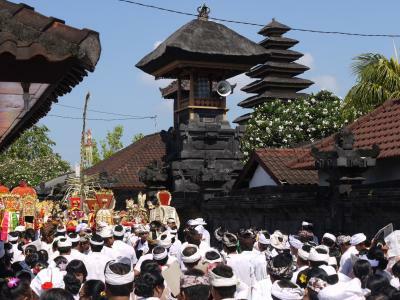 Bali is nominally Hindu, but there are a lot of animistic gods and spirits to appease as well. I didn't ask if they did some controlled studies to verify whether the fruit voodoo works or is just a waste of fruit. Finally I went back to the hotel and spent the afternoon at the pool. Fragrant Frangipani blossoms float on the water, and the staff brings cool juice. I managed to catch up on reading a little. After hurrying about hectic Bali for a few days, I decided to conclude my visit to Indonesia on the quiet little Gili Air island just off the coast of Lombok, the next major island past Bali. 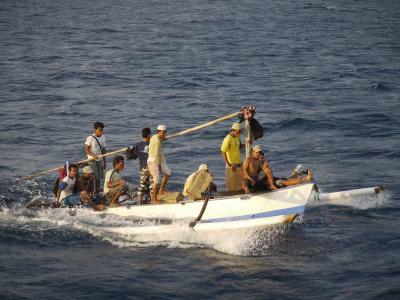 Perama runs a boat there from Perambai in Bali. 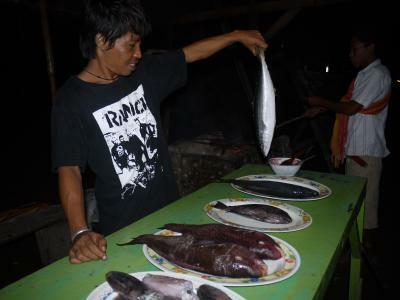 There are no piers in Perambai, Lombok, or any of the three Gili islands; the tour begins by wading out to a small boat, which transfers passengers to the larger Perama boat that runs between Bali and Lombok, and calls on the Gilis as well. In China, they would call this kind of boat a junk - not very large, all wood, with a lower enclosed deck and a sun deck on top. It's a very relaxing four-hour trip. 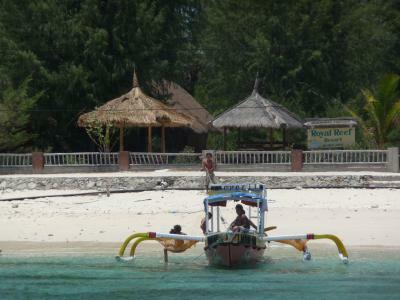 Then a dinghi transfer to Gili Air, wading onto the beach, and I am in a tropical paradise. Gili air is the opposite of Kuta. It's very small, one can walk all around it in an hour and a half. 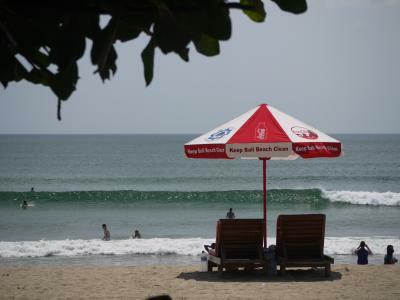 There are many trees, little scattered villages, and a string of restaurants and hotels right at the southeast beach. They have little bamboo platforms, some with thatched roofs, seating (or should I say reclining) four, directly on the beach with a great view. Most of the buildings are made from bamboo and straw. Bricks, mortar, and metal are rarely used. 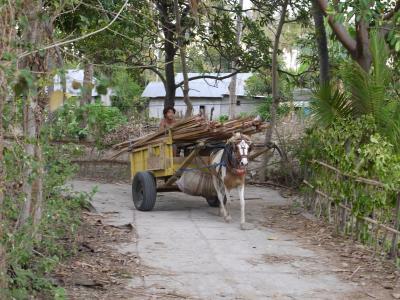 There are no cars or motorcycles on the Gilis, and no asphalt; everything is done by bicycles and horse carts. The only sounds are the surf, cicadas, geckos (how can such a small creature make such loud calls? ), roosters, and other animals. It's all exceedingly pastoral and unspoiled, and meets the stereotype of an ultra-relaxed tropical island exactly. Not much happens here, ever. There is an Internet café but it was closed because the family was preparing for a wedding. I was staying in the wonderful Coconut Cottages, generally agreed to be the best hotel on Gili Air. I went on a snorkeling trip by boat that stops at various coral reefs around all three Gili islands. The boats here are narrow with two outriggers held by curved struts. Just sitting on the boat and watching the outriggers slice through the water is incredibly relaxing. The corals are good, but not as good as on Pulau Weh in Sumatra; large swaths have died and look like boneyards. But there is an incredible variety of fish, and we saw turtles swimming as well. Snorkeling was best on Gili Air. The next day I went out with Lee, another backpacker I met on the way to Lombok. He was planning to continue to Komodo to see the dragons, but got into a really bad head-on truck collision so he - wisely - decided to recuperate on Gili Air. We just walked out into the water where the beach restaurants cluster, and the snorkeling was just fantastic. The corals are better there than any of the others I had seen, although still not as good as on Pulau Weh. But the number and variety of fish was much greater. I found myself in the middle of huge shoals of glittering silver and blue little fish, sometimes swimming randomly but then, as if on a signal, aligning in one direction and racing away. Others have white, black, and yellow tiger stripes, or a rainbow of hues. And we saw several turtles. They don't mind if you dive down to watch them, but turtles can move very swiftly underwater. A few dolphins were playing at some distance from the beach. Vendors walk down the beach with big baskets of fruit and souvenirs on their heads. We bought pineapples from one lady, who slowly set down her load, pulled out a big curved knife, and started to artfully carve the pineapples in the spiral fashion they use everywhere here to remove the skin. The fish on the island is fantastic. They catch the fish right there and put them on display in the evening. You pick one and they'll barbecue it for you. Delicious. But most of the time I was busy doing nothing, sitting on the beach or in a hammock reading a book. The days blended into each other and the little attention I had been paying to things like the day of the week was fading entirely. 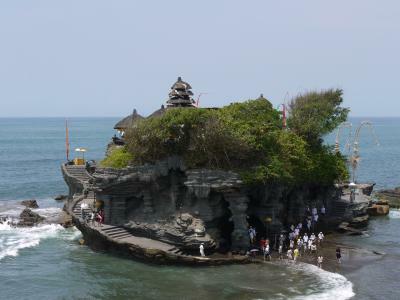 Tanah Lot is a pair of Hindu temples built on large rocks in the sea. The larger one is reached by wading out through shallow water on the lee side of the rock, while the surf crashes on the rock at the other sides. They have a holy spring in a cave at the bottom, where everybody gets sprinkled with holy water and gets some rice stuck to the forehead. That's your ticket to walk up the stairs to the temple, except that stair doesn't go very far because the temple at the top is closed to visitors. The other rock is similar but much smaller, and instead of wading there is a rock bridge. It's closed too. They also have a cave with a big holy snake, but the cave of the roof is very low, maybe 80cm, and there is lots of garbage. Several local tourists wanted their picture taken with me. My driver says I look like a movie actor, maybe he is looking for a bigger tip? Julia Roberts is currently filming just east of here, at Ubud. Had a great Indonesian lunch, with bakwan dumplings and "sicko juice". That's spirulina, banana, apple, and papaya; deep green. The other meaning of the word is not known here. 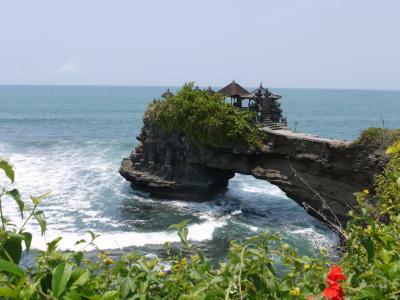 The Ulu Watu temple is at the southern end of Bali. 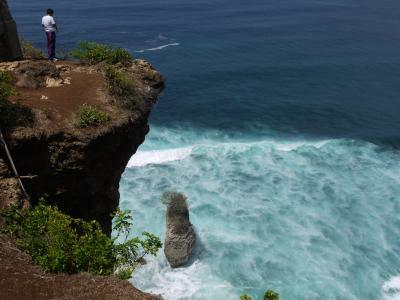 It's small but very scenically perched at the edge of a huge cliff that falls down vertically to a foaming ocean. Admission includes a rental sarong. As before, the temple can't be visited but the real attraction are the views of the ocean anyway. There are signs everywhere warning not to wear sunglasses or necklaces because the monkeys living here will steal them. Further west, there is a little village nestled on the hillside overlooking the rocky Suluban Beach. This is a surfer mecca, and there are lots of surfers out in the waves, waiting for a big wave that never seems to arrive. It looks very peaceful and a little futile but I am told this place is too dangerous for any but the most experienced surfers. Slow day. 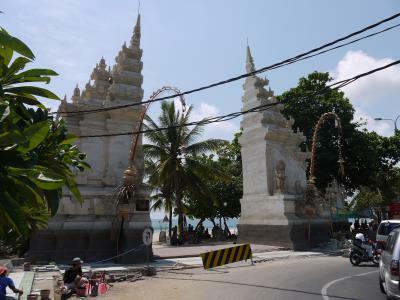 Walked to the beach, then to the Pura Peti Tenget temple, but I couldn't get in because they require a sarong but don't rent any. 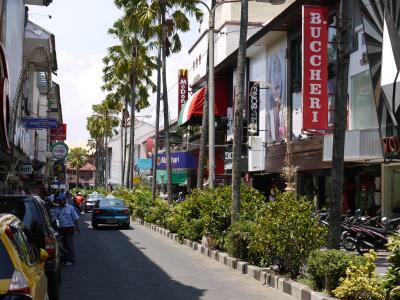 Walked further to Legian and Kuta, a final Indonesian lunch, nothing exciting. Back to the hotel, swimming in the pool once more, then off to the airport to catch a flight to Melbourne. Today is my 30th day in Indonesia, and the day my visa expires. Extensions are not possible so I had to flee the country.